This weekend thousands of women will run marathons and half-marathons in Ireland. Hundreds more will take the plunge at triathlons in Mayo and Athy. I talked to Australian Ironwoman Carolyn Hewett at her London base and asked her for some tips. Tops with a built-in bra aren't any good usually, they are too loose. You work out the best bra for yourself. 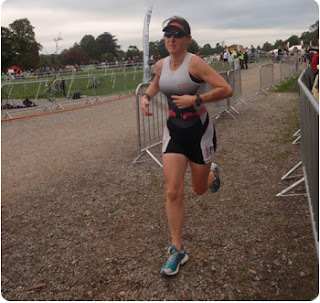 I wear two layers: a good bra, then a cropped top and the tri-suit. It hurts otherwise. I like the Berlei Shock Absorber. And comfortable underpants are pretty important too. I learnt my lesson a few years ago when I swam in the Thames. It's pretty grotty. When I came out I had a brown line on my face from the slime. So now I rub my face before I get out. It's important to be a girl too, I have done five years of research into the best waterproof mascara. I use nail polish too - a red one with a white base so it won't come off in warm water. On the Ironman routes, you see much older people racing. There is one guy who is in his 80s and I've seen women up to their early 60s. I met another woman in her late 50s and she was doing an Ironwoman. You get people taking up triathlons when they are a bit older, people in their 40s kicking the butts of people in their 20s - maybe because your kids are older or you have more money to buy a light bike. I live really well, I hardly drink. If you get injured work out how to isolate the injured part and train around it. Last year I tripped and tore ligaments in my ankle so I couldn't run or swim. But I could bike. If you're starting out, women's only races are great. There's a nice, safe environment with women of every shape and size. (On the last one I did) I could hear two little girls screaming 'come on Mummy', it was so great. A longer interview with Hewett here. And Hewett's own blog on sponsor Wiggle's site is here. Wordless Wednesday - winning or losing?